An experimental U.S. military drone built to fly at blistering speeds of up to 3,600 mph — six times the speed of sound — plunged instead into the Pacific Ocean just seconds into a test flight on Tuesday (Aug. 14), Air Force officials say. The unmanned X-51A Waverider vehicle separated from its B-52 Stratofortress bomber mother ship as expected and fired up its rocket booster, but a control fin failure sent it plummeting into the sea about 16 seconds into the flight. "It is unfortunate that a problem with this subsystem caused a termination before we could light the Scramjet engine," program manager Charlie Brink, of the Air Force Research Laboratory (AFRL) at Wright-Patterson Air Force Base in Ohio, said in a brief statement released today (Aug. 15). Hypersonic flight is generally defined as anything reaching speeds above Mach 5 (3,805 mph, or 6,124 kph, at sea level). Tuesday's test flight began over the Point Mugu Naval Air Warfare Center Sea Range. Project officials had hoped the X-51A's scramjet would sustain hypersonic flight for up to five minutes before the vehicle splashed down in the Pacific. The U.S. military has been studying hypersonic flight in order to develop new weapons capable of striking targets anywhere on Earth within an hour. 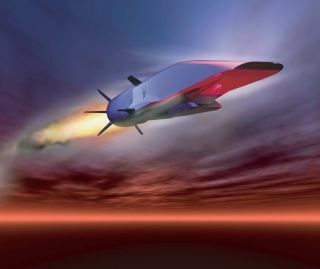 In addition to the Air Force's X-51A program, the Defense Advanced Research Projects Agency (DARPA) has launched two tests of its HTV hypersonic bomber prototype, which reached Mach 20 before losing control in an August 2011 test flight. Tuesday's test flight marked the third demonstration of the X-51A program and the second major setback for the project. The first test launch in May 2010 was hailed as a success, as the X-51A vehicle flew for more than three minutes at Mach 4.88, breaking a hypersonic flight duration record set by NASA in 2004. Last year, in June 2011, the Air Force launched a second X-51A test flight that ended prematurely, splashing into the Pacific without ever reaching its top speed. In both previous test flights, the control fins worked as expected during the boost phase. Indeed, X-51A project officials were confident going into Tuesday's flight test. Program managers plan to conduct an in-depth evaluation to determine the exact cause of Tuesday's flight test failure. In the meantime, the AFRL will wait to see when, if ever, its last remaining X-51A vehicle will fly, program officials said.